M-health can be defined as the 'emerging mobile communications and network technologies for healthcare systems.' This book paves the path toward understanding the future of m-health technologies and services and also introducing the impact of mobility on existing e-health and commercial telemedical systems.�M-Health: Emerging Mobile Health Systems�presents a new and forward-looking source of infor… mation that explores the present and future trends in the applications of current and emerging wireless communication and network technologies for different healthcare scenaria. It also provides a discovery path on the synergies between the 2.5G and 3G systems and other relevant computing and information technologies and how they prescribe the way for the next generation of m-health services. 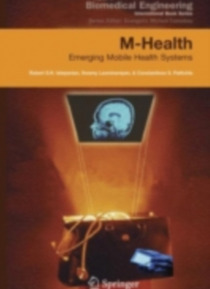 The book contains 47 chapters, arranged in five thematic sections: Introduction to Mobile M-health Systems, Smart Mobile Applications for Health Professionals, Signal, Image, and Video Compression for M-health Applications, Emergency Health Care Systems and Services, Echography Systems and Services, and Remote and Home Monitoring. This book is intended for all those working in the field of information technologies in biomedicine, as well as for people working in future applications of wireless communications and wireless telemedical systems. It provides different levels of material to researchers, computing engineers, and medical practitioners interested in emerging e-health systems.�This book will be a useful reference for all the readers in this important and growing field of research, and will contribute to the roadmap of future m-health systems and improve the development of effective healthcare delivery systems.